POSTED October 19, 2018 10:54 a.m.
SENECA - This past September, a former Seneca resident, Sheldon Bartles was among those who were honored by participating on the Badger Honor Flight. Five area veterans were given the very special opportunity to participate in the Badger Honor Flight. Sheldon Bartles, Don Marish, Michael Larson, John Kohout and Ron Larson were among the many vets who have had the opportunity to take the trip of a lifetime to Washington DC. 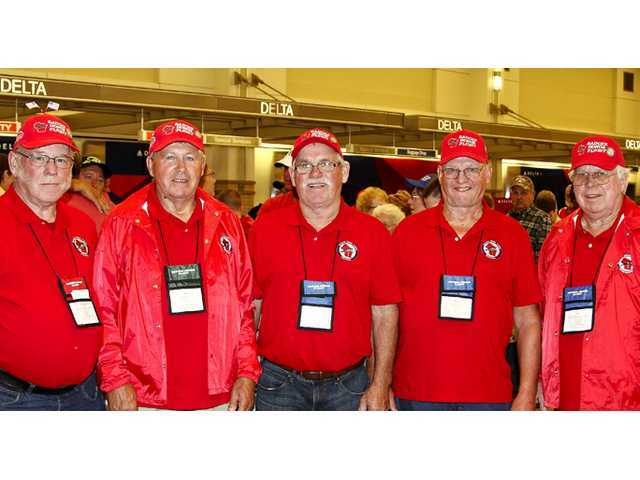 The Badger Honor Flight is the Wisconsin branch of the National Honor Flight network. The Honor Flight was the brainchild of Earl Morse a retired Air Force Captain and pilot from Ohio, who worked with the Department of Veterans Affairs. The idea quickly took off following the completion of the World War II Memorial in Washington D.C. when Morse found himself discussing the memorial frequently with his patients. As the weeks went by, the idea of veterans visiting the memorial continued to blossom in Morse’s mind. Morse decided to pursue his fellow pilots and ask if they had any interest in helping him fly Veterans out to the D.C.
After his first meeting, Morse found himself with eleven licensed pilots. All of whom stepped up to volunteer and the Honor Flight was born. The very first Honor Flight Tour took place in 2005. Six small planes took off out of Ohio carrying 12 WWII Vets to visit our nations capital. The response, just as it is today was overwhelmingly positive. As the months went on, more flights were scheduled and by the end of the first year 137 WWII Veterans had been transported to their memorial. The next year, commercial flights became the mode of travel of choice as so many veterans had jumped on the waiting list. This change allowed another 300 Veterans to complete the journey in 2006. The first Honor Flights established in Wisconsin were the Freedom Honor Flight operating out of La Crosse and the Stars and Stripes Honor Flight in Milwaukee in 2008. After participating as guardians in other Honor Flights, local volunteers decided to form another hub in Madison to serve veterans from surrounding counties. Those volunteers began meeting in early 2009 and adopted the name ‘Badger Honor Flight’ with the first official flight under that name taking place in 2010. In the time it’s been in operation the Badger Honor Flight has had the privilege of flying over 2,700 Veterans to Washington D.C.
Sheldon Bartles of Fennimore also participated in the memorable and very special Badger Honor Flight. However, when October 1964 rolled around, Bartles was sent south to sunny Flordia to the Eglin Air Force Base. “They had just about every kind of plane there was down there,” Bartles recalled. While at Eglin, Bartles was presented with an opportunity to travel the country, completing temporary assignments on other bases. While enlisted Bartles parents had moved to Fennimore, so when he was on leave he stayed with them and it was then he met his wife Mary. Following a whirlwind romance, the pair were married while Bartles was on another leave in 1967. That was all right before he left for his tour of duty in Thailand. The cultural differences were a bit of a learning curve for Bartles and his fellow soldiers, who may have found the food offerings to be one of the strangest things they encountered. While in Thailand, Bartles worked as a jet engine mechanic, something not to far from his experience from back home. It was there in Thailand where the planes that were working in Vietnam would layover and get tuned up by the hands of Bartles and the other men stationed there. “They had to be in tip-top shape to be out there,” Bartles noted. In 1968, Bartles was discharged and went home to Fennimore to meet his wife Mary and his six-month-old daughter. It was the same home in which they currently reside. For Bartles, the chance to participate in the Badger Honor Flight was something he will never forget for the rest of his days. Bartles filled out his application about two years ago and was placed on the waiting list with his fellow area vets for the honor flight. In the spring, he received the call that his name was up on the list for the flight, but a scheduled hip surgery caused Bartles to move his trip back to September. It was a choice he was glad he made, as he was able to trek the memorials throughout the day. Bartles attended with his son Kevin and the pair were able to see all of the monuments they desired. Out of the places he visited during his trip, Bartles noted that Arlington Cemetery may have been his favorite. Being on the bus with so many fellow veterans also seemed to be quite the pleasant experience for Bartles. Although Bartles was deeply impressed with the trip as a whole, the welcome home ceremony was particularly special.